Unusual Newlyn School Arts & Crafts large copper wall pocket/candle or post box with typical Newlyn stylised fish design as to be expected. However, this is by the top master metalworker John Pearson himself (fully stamped mark, shape number and dated for 1901 to base). 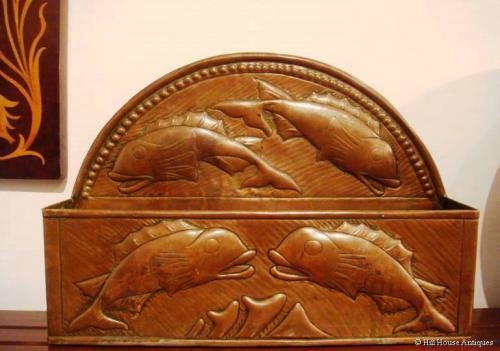 Of course it is well known and documented that John Pearson taught at Newlyn, but this is the first time we have come across a piece by him, where the fish design would normally be attributed to the Newlyn School itself. c1901. Just goes to show that there is no singular typical John Pearson style! Approx 15.5" wide and 11" high.